"A vampire hunter. A vampire. Simple? You’ve no idea . . . "
Regan St. James is just your typical eighteen-year-old vampire hunter. He enjoys sharp objects and random hook-ups. But one night, in a quiet little mountain college town, he meets a guy named Ira who just might change his life. If he can survive Ira’s relatives, of course. Dead Boyfriend - Courting Death has not been tagged yet. Help others find Dead Boyfriend - Courting Death by tagging it! 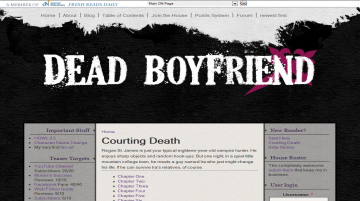 Dead Boyfriend - Courting Death has not been recommended yet.